For the 33rd year in a row, Brownsville Radio will conduct its annual Christmas Basket Radiothon. But the procedures have changed, and so have the organizers. Historically co-sponsored by Franklin Smith, the baton is passing to a wide and diverse group of community supporters. An entirely new list of recipients has been developed based exclusively on referral. Leading the effort to help with the fund raising, selection of recipients and the delivery of the gifts, is a diverse group of almost a dozen organizations and even more individuals led by County Commissioner Christan Byars. The sponsors include an all-star cast of groups ranging from local banks and other businesses to churches and 501c-3 organizations, including the Brownsville/Haywood County Chamber of Commerce. The recipient list includes 133 names. The group has projected that $9,975 will be required to pay for the baskets, but more would be needed to include toys for families with children. The charitable project started in the 1980’s when Brownsville Radio morning host Paul Jackson and station manager Carlton Veirs learned there were those so poor that Christmas would be just another day for their families. The Brownsville Jaycees were the original co-sponsors, managing the logistics of the food and toy purchases and the delivery. When the Jaycees disbanded, Franklin Smith, then the Haywood County Executive, took over and became the co-sponsor. Smith has retired but promises to provide guidance to the new co-sponsors this year. “We never really kept up with how much was raised from year-to-year,” Jackson said. “The first year we were amazed when contributors called in $4,000 or so.” From there the project grew. During more than one of the fundraisers, the station took in over $30,000. Thousands of gift boxes have been provided with the more than the half-million dollars estimated to have been donated over the years. There was discussion about discontinuing the project after last year. “We were conflicted. We knew it needed an overhaul, and it looked like no one was willing to take it on. But when all of these people showed up to help and reorganize we were persuaded to keep it going,” Veirs said. “We know there is need…there’s just no doubt about it, but we want to make sure we ask our listeners to invest in a worthy cause…these guys convinced us,” Jackson commented. 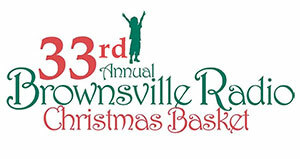 The Brownsville Radio Christmas Basket Radiothon is Friday November 30 beginning at 7am. Pledges may be made on the air at 772-3200 or 772-3500 and off the air at 772-3700.